Enjoy the relaxing moments that sitting around a fire brings with a rust-resistant Campfire Ring. 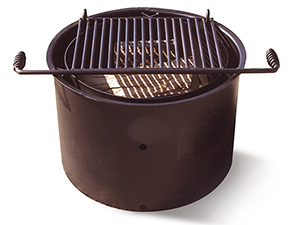 Constructed utilizing 7-gauge steel, a 1" lip and MIG welded seams, the Campfire Ring fire pit grill offers lasting durability. Providing 300 square inches of cooking area the grill grate is designed with 5/8" steel support bars and non-conducive cool coil handles, for the convenient transition of the grate on and off the fire ring. Built for the safety of users and surrounding spaces, the 7", 9" and 18" Campfire Ring comes standard with 'U' 1/2" steel anchor pins for permanent, in-ground installation. Units available without grate and only the universal access 18" model comes with or without an inner steel ring.